The early fall Wildflowers are such dynamos. They are among the most powerful of all our Flower Essences, and they always feel so perfectly helpful. Today on a walk I encountered old friends including Bottle Gentian, Silver-rod, Goldenrod, Jewelweed, Self Heal, Niella and Joe Pye Weed. 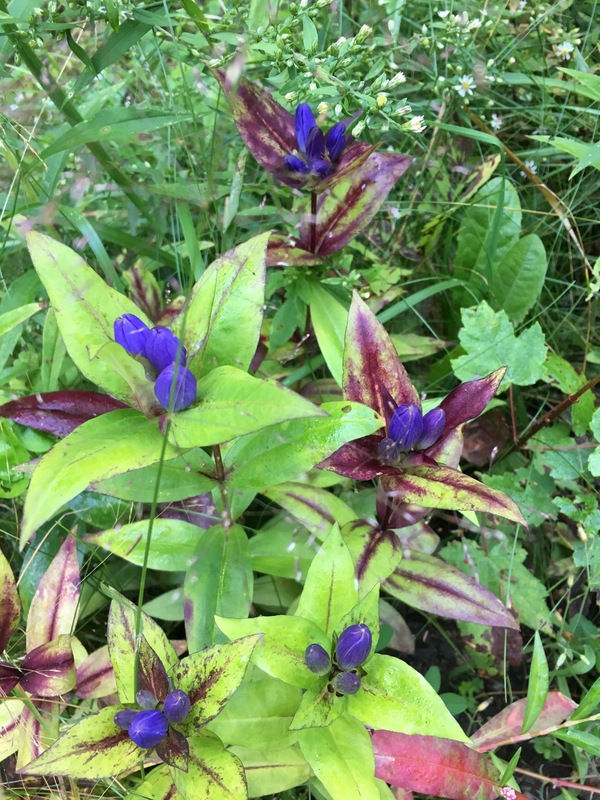 Bottle Gentian has been one of my favorite Essences for decades Nothing rivals its incredible wisdom about seeing clearly and holding our own in complex and chaotic situations. I know for certain this is the first Flower Essence I ever made because I started to make this one regularly when I was about six. Without telling any grown-ups, I would go out to this fort I had made in the scrubby lilac bushes behind our barn, hauling my dolls and a battered tin tea set. I would soak Goldenrod Flowers in water then drink up this “tea” with the dolls sharing in the brew. I can taste this glorious concoction still. No doubt it helped me stand in my truth in a family that never really got my passion for wild plants or pretty much any of my passions. 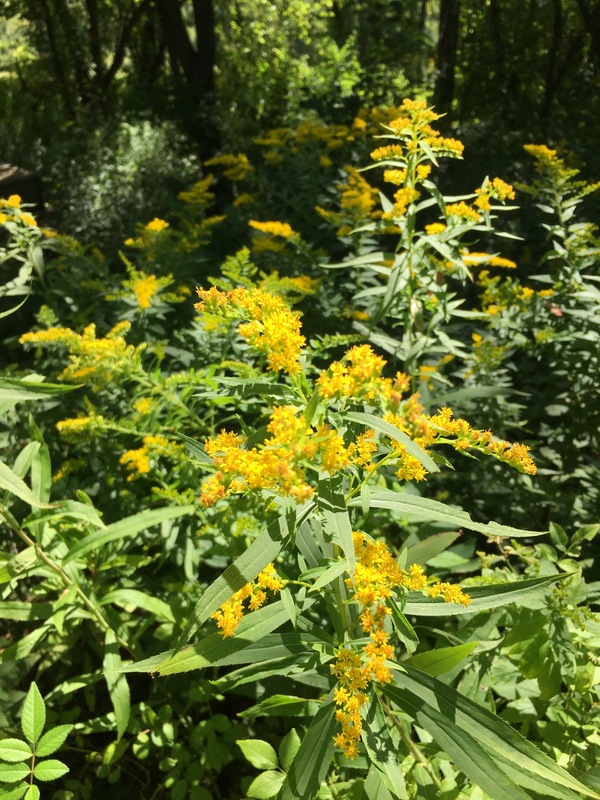 Goldenrod is a good one to be blooming right now as children go back to school since school is such an enormous arena in which we learn how to be true to ourselves and be a goldenrod of our own wisdom and not a follower of other people’s ideas. My first serious connection to Jewelweed came when I got poison ivy and read in Euell Gibbon’s Stalking the Wild Herbs that Jewelweed was an excellent antidote to poison ivy. I followed his directions to make a topical potion from Jewelweed and used it whenever I got a rash from poison ivy. This was an all too frequently as we had a neighbor who would frequently burn poison ivy leaves in his brush piles. I was meticulous about avoiding contact with this plant on my own forays into fields and woods, but still needed my Jewelweed potion which I would freeze in ice cube trays then rub on the rash. How delighted I was to find, decades later, that Jewelweed also made a fabulous Flower Essence and for, of all things, IRRITATIONS. I love how plant medicine is so consistent! 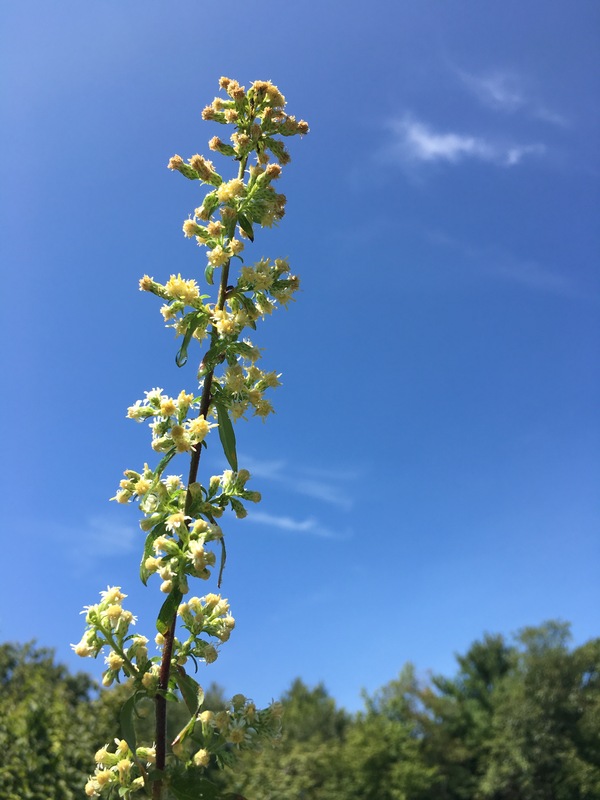 When summer staffer Rex got poison ivy this summer when he made new pasture for his sheep, alpacas and chickens, we led him right to the Jewelweed Flower Essence and also went over and over this plant’s anatomy with him so he would steer clear of it in the future. When I took care of his animals for a short stretch this summer I was surprised his poison ivy wasn’t worse! The area where the chickens had their run was about 98% poison ivy!!!! Yikes! Self Heal is another old friend and one I am always so happy to meet in the woods. What could be more important than each of us coming into clarity about our own healing gifts and our right to be well. I am always on the look out for Niella because the two places where I originally found it growing in luxurious abundance are no longer places I can visit. It was a joy to discover a very lush patch on this morning’s walk. This one is a Flower Essence of mysterious depths and powers. Niella is one of those Flower Essences that people write us about in long fascinating letters. It is one of those Essences that people have had such profound experiences with. I was so glad to find it today. 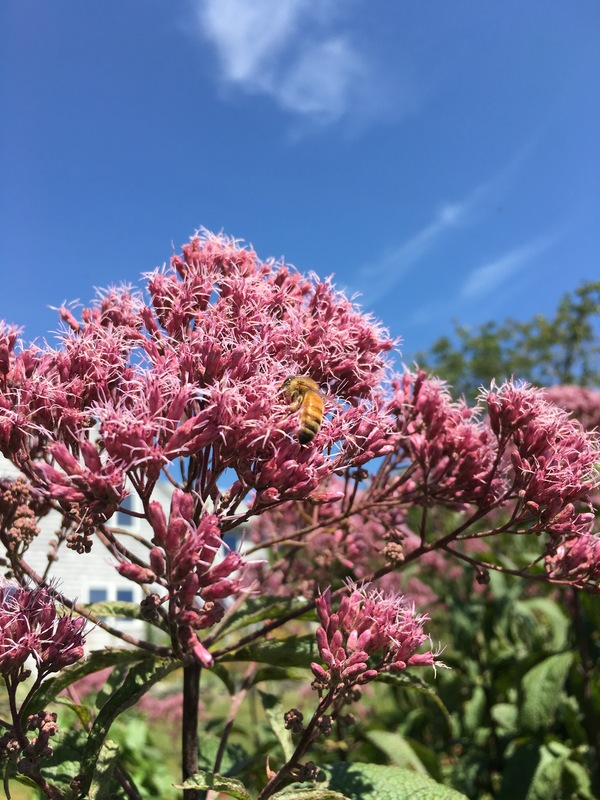 Joe Pye Weed is such a good one for Labor Day weekend. a holiday in which we are encouraged to rest from our labors, lay down our burdens and rest. Joe Pye Weed reminds us ACTUALLY DO THIS and reminds us that Divinity is always there to carry our burdens for us. Thank you Joe Pye Weed! Love and Labor Day Blessings to all of you! May you have a peaceful weekend!